Welcome to my first post in a new series I'm working on called . . . Inspired by my latest addiction, the Fashioning Change online ethical clothing shop and its Wear this, not that look book, I'll be referencing looks from the latest fashion magazines and sharing how to achieve the look sustainably. First up is the cover image of the latest InStyle Australia, featuring the stunning Miranda Kerr. So, how can this beautiful look be achieved sustainably? It's quite simple. Model - Miranda stays, of course! Between her range of natural body products, Kora Organics, her book encouraging self-esteem and acceptance, Treasure Yourself, and her love of yoga and a natural diet, she's the perfect choice! by local women in Los Angeles. Perfect now that winter has hit Sydney! always feminine and flattering, and this fire engine red piece is HOT. Bracelet - The magazine's cuff is from Harlequin Market; HM do carry divine vintage pieces among their collection, but it's not clear from the product listing if the cover's bracelet is vintage. No matter, check out this gorgeous vintage piece! 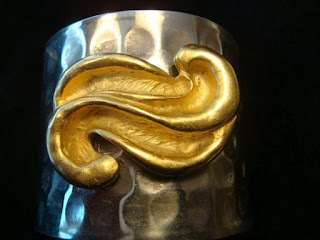 This beautiful cuff is from a vintage seller on Etsy. It's only $35 USD - if you like it, order quick, or I may just buy it! And there you have it - I told you it would be easy! When it's this simple to eco your look, there's really no reason not to stay in style, sustainably. Keep your eye out for the next installment, and let me know if there are any looks you'd like help to create sustainably.